NEW YORK, March 26, 2019 — (PRNewswire) — Microdesk, a global AECO consulting firm, is celebrating its milestone 25th Anniversary this year. Over the last 25 years Microdesk has grown from a two-person New England reseller, focused on design and GIS solutions from Autodesk, Softdesk, and ESRI, to a global BIM consulting firm addressing all aspects of design, construction and operations with a mandate to assist the industry with meeting the challenges of Globalization, Urbanization and Sustainability. Founded by Michael DeLacey and Robin Adams in 1994, Microdesk has always had a passion for best in class solutions. And Microdesk continues to be at the forefront of the AECO industry with Cloud Solutions from Autodesk and Panzura, along with Asset Management Solutions from IBM. Microdesk has seen unprecedented widespread growth of the firm, stemming from its rapidly growing consulting business and partnerships with industry leaders like Autodesk, Panzura and IBM. Microdesk now has 13 offices across the United States and United Kingdom, with 300 employees and growing. DeLacey stated, "As we celebrate our 25th year, I want to express my thanks to our clients, many of whom we've been working with since the beginning in 1994." DeLacey went on to say, "I can't imagine having a career in any other industry. Working in AECO has provided me with the opportunity to work with the smartest, most creative, hardest working and sincere people anywhere." 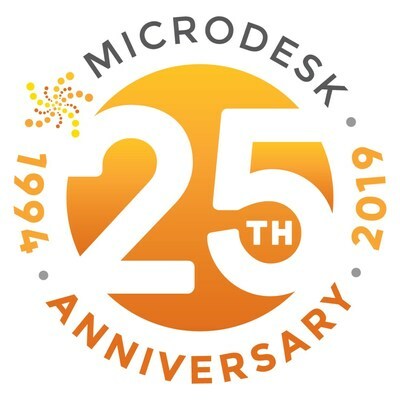 Microdesk will be celebrating its 25th anniversary throughout the year by sharing memories about where they started, discussing what the industry and technology has achieved, and talking about their plans for the future. You can follow Microdesk's social channels for more information on their 25th anniversary: #buildingsuccess25years, #microdesk25.